A good night’s sleep is incredibly important for overall health and wellbeing. From improving concentration and productivity to reducing weight gain, getting quality sleep can make every aspect of your life better. The secret to instantly improving sleep quality lies in your pillows. 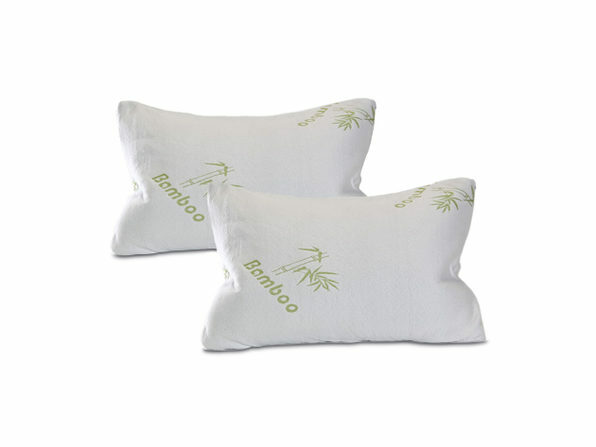 If you want to combat insomnia, aches, or other sleep issues, the Comfort In A Bag Bamboo Pillows is a great choice. Get a 2-pack of these bamboo pillows today for under $40. Each Comfort In A Bag Bamboo Pillow is constructed from a natural multi-layer memory foam and bamboo cover case. Memory foam is the perfect type of material for a pillow by providing the optimal amount of cushion and firmness. Unlike most pillows, these bamboo pillows will never go flat. All the material used in making these pillows are hypoallergenic so that you can breath easier at night. The bamboo cover cases are machine washable as well. The key difference of the Comfort In A Bag Bamboo Pillows compared to other types of pillows is how it improves your posture. With your head at the ideal angle, you’ll snore less and get more oxygen flowing to your lungs. Get the Comfort In A Bag Bamboo Pillows (2-pack) today for just $39.99, which is 80% off the original price.